Allow me to provide you with some background - on March 15th, the Hoboken City Council authorized me, in my capacity as Mayor, to acquire the Union Dry Dock Property by friendly acquisition or by eminent domain, as a last resort. At that time, the City also conducted a thorough evaluation of the property and received an appraisal valuing it at $11.63 million. With this information in hand, I felt that it was in the best interest of the City to make a fair and friendly offer to NY Waterway. I now await their response. In my letter to NY Waterway, I stated that condemnation or the use of eminent domain would only be implemented if all parties are not able to engage in voluntary negotiations. The City’s goal in these negotiations are two-fold: to (1) secure the Union Dock Property and advance our long-envisioned plan of a contiguous waterfront; and (2) work cooperatively with regional public and private stakeholders to assist NY Waterway in securing an appropriate location for their refueling, repair and maintenance operations. 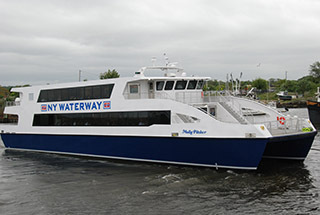 To be clear, NYWaterway’s intentions for this property is not to add another ferry stop in Hoboken, but rather to use the facility solely as a refueling, repair and maintenance location. Talking Ed Note: This is not an end but a stop on the road to an uncertain outcome in what will be a lengthy process. There's no doubt an effort to refund the purchase price to NY Waterway will fail. There's no proposed solution and "the offer" ends there. There's a larger road paved with bigger players at the state level: Governor Phil Murphy, 30,000 commuters and of course NJ Transit. If there's an opportunity to create a solution near the downtown Hoboken PATH, a compromise may lead to a wider pathway for residents at the Union Dry Dock and perhaps valuable condos at the location. Time will tell but this process is likely not near the halfway point. Let's hope the mayor will be able to influence all involved to a positive outcome.